Former WA Bicycle committee member Richard Stallard of Nedlands said the law stated people aged 12 and over were not permitted to ride on footpaths. 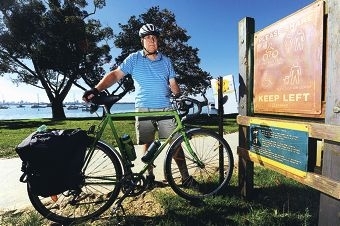 ‘So thousands of people will be deprived of the enjoyment of cycling through Matilda Bay park land,’ he said. Last week, Department of Environment and Conservation staff told Mr Stallard a 2.1m concrete path along the popular walking, picnic and family-cycling route would not be widened to 3.3m in bitumen and not designated dual-use. Mr Stallard said scrapping the upgrade cancels a 2011 State Government promise to spend $140,000 on the work initially requested more than 20 years ago. He said the Government’s current work on a 2m-wide concrete path would be a ‘monumental waste of money’ because it did not get rid of sharp turns and failed to qualify for Australian Standards. A DEC spokeswoman said wider path encouraged cycling speeds while walking, jogging and slow speed cycling were encouraged in the reserve where all cyclists were still permitted to use the path. ‘There has not been a budget cutback. The original allocation was $140,000, which was then increased to $240,000 to allow for a further distance to be upgraded,’ she said. Work is scheduled to be completed within five weeks.